In just over three years, two dams have collapsed in the same Brazilian state, leaving thousands of families in mourning. This time, some Brazilians say they fear that the country’s monitoring system is deeply flawed. 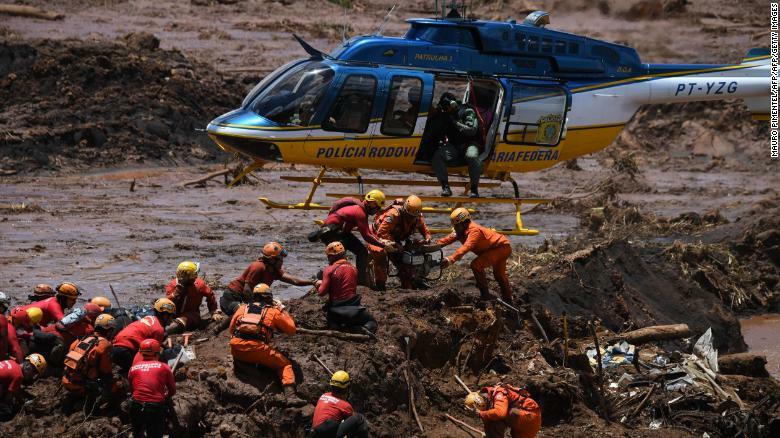 Rescue workers search for victims in Brumadinho. Both dams are associated with the Brazilian mining giant Vale. The disasters have renewed scrutiny of the company’s practices and of environmental regulations in Minas Gerais. The latest tragedy in Brumadinho also comes against the backdrop of Jair Bolsonaro’s rise to power. The far-right president is an outspoken critic of environmental protection and activists fear that he will loosen regulatory conditions and make another mining disaster inevitable. Brazil’s National Mining Agency classified the Brumadinho dam as “low risk” just weeks before its collapse, the agency confirmed to CNN. The certification— which found the dam “stable”— has raised serious concerns among some analysts, who said that classification undermined the audits of other dams across the country. “If this so-called ‘stable’ dam is breaking, there is no guarantee whatsoever about the security of other dams in Brazil,” said Luiz Jardim de Moraes Wanderley, a mining specialist at the State University of Rio de Janeiro. “It shows a major problem in the public and private monitoring and inspection of dams in the country,” he added. It’s a view shared by Wanderley, who said the safety evaluation method was “problematic,” and that there was “no public control over this evaluation.” “The Brazilian state does not have enough staff to inspect all the country’s dams, basing their data only on the companies’ report and audition,” he said. Vale contractor TÜV SÜD evaluated Brumadinho dam for safety in June 2018 and September 2018, the German firm said in a statement emailed to CNN. TÜV SÜD expressed regret for the dam break, but declined to comment further “due to recent investigations.” The firm said its September inspection of the dam had revealed no damage, the New York Times reported. A Vale spokeswoman also told CNN it had “no comment” on the mining regulation process. An aerial view shows a collapsed bridge caused by the burst dam. Vale has said it is “fully cooperating with authorities” in light of the arrest warrants issued. 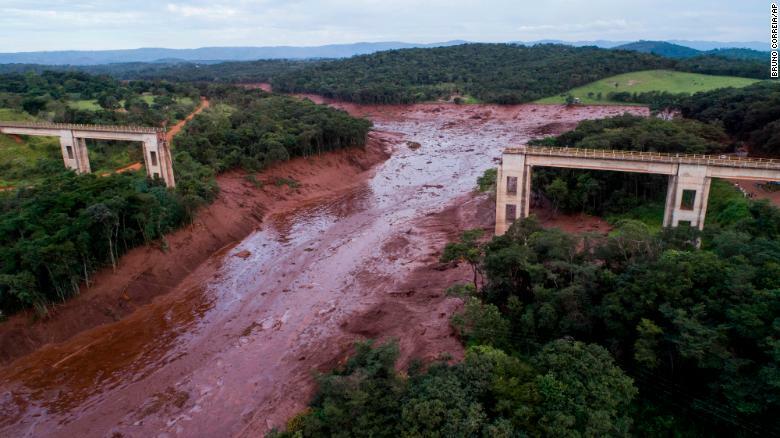 In response to the tragedy, Vale chief executive, Fabio Schvartsman, said Tuesday that the company will decommission ten dams similar to Brumadinho. “This is the adequate and needed response in face of this enormous tragedy that we had in Brumadinho. This plan was produced 3 or 4 days after the accident,” he said of the closures at a press conference in the city of Belo Horizonte. The announcement follows Vale chief financial officer’s promise on Monday to donate 100,000 reais ($26,500) to “the families of each missing person or confirmed fatality” of the Brumadinho disaster. But Greenpeace Brazil says that, with two disasters in just over three years, Brumadinho was “not an accident” but a “crime against people and nature.” “How many lives do we still have to lose (until) the Brazilian state and mining companies learn from their mistakes?” said Greenpeace Brazil campaigns director Nilo D’Ávila in a statement. For years, various political parties and businesses complained that Brazil’s mining licensing process was slowing development, said Kathy Hochstetler, Professor of International Development at the London School of Economics and Political Science. Shortly after the Mariana disaster in 2015, the state of Minas Gerais simplified the environmental licensing process. Under the changes, the state’s multiple stages of licensing can now be reduced to one, several experts told CNN. But in the interest of accelerating operations, environmental assessments became less detailed, with very little input from environmental agencies and the public, the analysts said. Brazilian president Jair Bolsonaro has already said that environmental regulations in Brazil—home to the Amazon rainforest—are too stringent. Shortly after taking office, he floated plans to combine the country’s agriculture and environment ministries but was forced to backtrack following international condemnation. “We intend to protect the environment without creating roadblocks to progress,” Bolsonaro said in November, Reuters reported. Environment permits sometimes take as long as 10 years for certain infrastructure projects and that “cannot continue,” he added. CNN contacted his office for comment on the president’s position on regulation, but had not received a reply at time of publishing. On Saturday, Bolsonaro expressed “sadness” over the deaths at Brumadinho in an official statement, and said that the Brazilian government will take all necessary measures to ensure such tragedies do not happen again.